I’ve been living in this cozy sweater all through our rainy season in San Francisco (look closely and you’ll see raindrops starting to fall as we were taking these photos!) And I love how soft it is–it feels like you’re wearing a blanket but looks perfectly winter cozy. This scarf was an amazing find and I love the soft brushed wool, its perfect for a rainy or snowy winter day and I love the firey red color. I layered all of this over my favorite go-to t-shirt dress which is the perfect fit and super affordable at $13 (yes that’s right!). I’ve purchased them in multiple colors and am currently on the hunt for a white and tan striped version. Another benefit of this bright color? I feel like my skin has a visible glow! I’ll definitely take it while I’m stuck in this rainstorm! That scarf is just beautiful. I love the colors and I love those big, bold strips of color. It pairs perfectly with everything else you’re wearing. You look absolutely gorgeous. I love everything about this look. The understated colors of the main outfit go perfectly with that bold scarf. I heart! 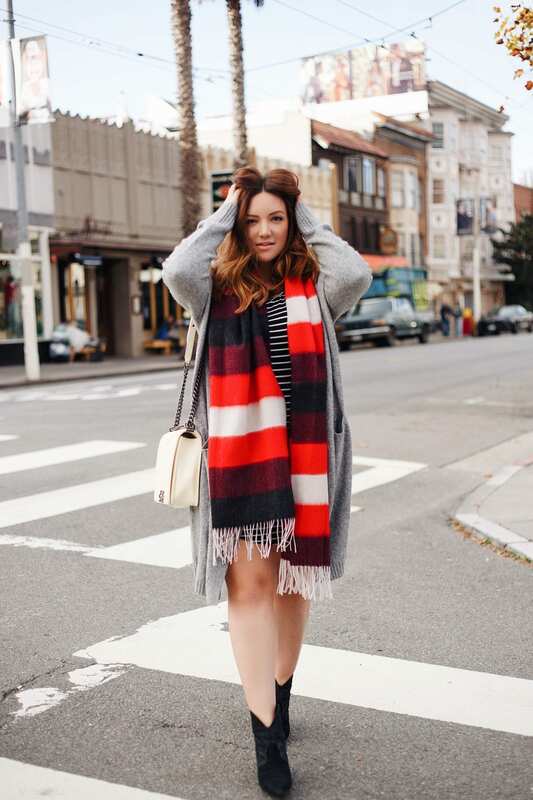 That scarf makes me wish we had the weather for it here in NOLA! It looks great on you! What an attractive scarf! I love how you are modeling it all around town! 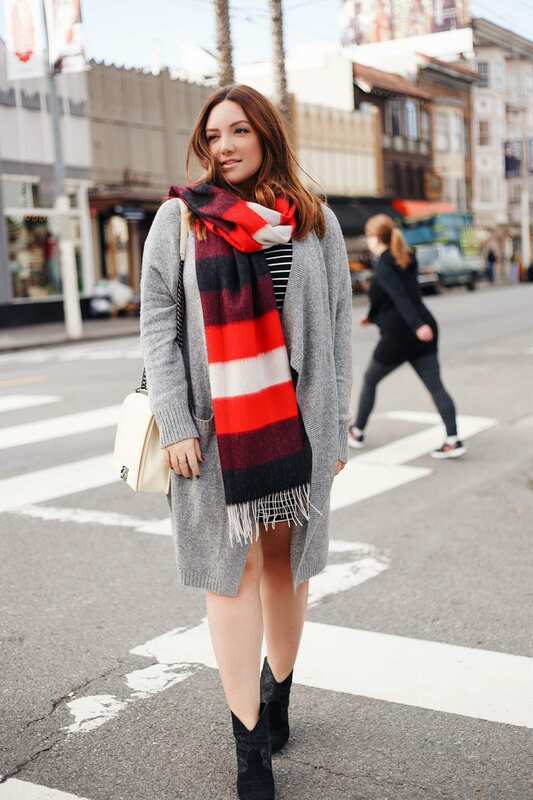 This is such a fun scarf! The cute accessories are my favorite thing about winter. I love that scarf. Not only does it look cozy, but it is bold and beautiful too. The scarf looks so good with your sweater. The colors really pop! This is such a cool outfit. What a great scarf! 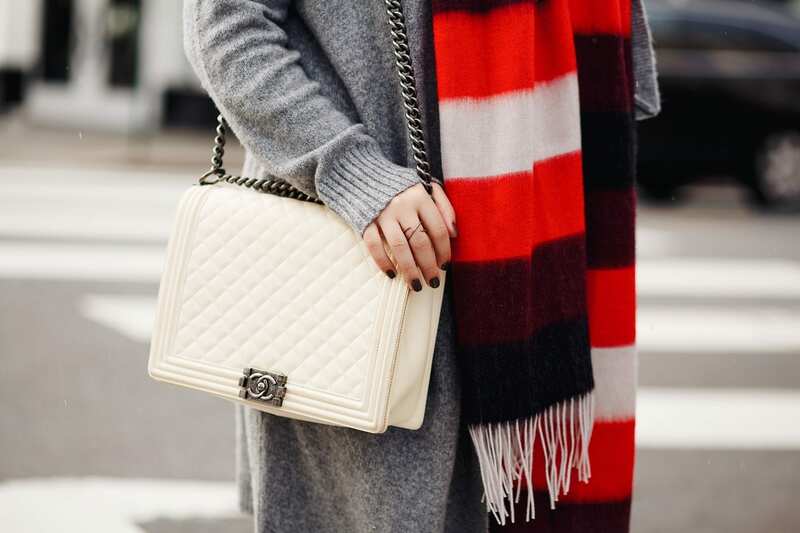 I love something that can be fashionable yet keep me warm in the winter! I absolutely LOVE this scarf and it looks awesome on you! I love having a great go-to scarf that can go with any outfit for the cold and rainy season. First of all , I LOVE SAN FRANCISCO, it’s the best weather in the world! The scarf is very chic and fashionable perfect for the city. I love that scarf! The colors are so bright and beautiful! It definitely does make a statement! thats a very nice scarf! i like the color combination! It looks great on you! I love how you paired it with your dress and bag! Such a great outfit! You look so pretty. The scarf is an awesome accent piece. I love the color of the scarf. It did stand out from the rest of your attire because of the bright colors. You really know how to make an ordinary piece of clothing look so chic and elegant. I love the pop of color this scarf gives your outfit. My Daughter would love it. It looks so warm and cozy. Now that is a scarf. So big and colorful I would love to rock this!